PCOS is the acronym for Polycystic Ovarian Syndrome. It is the most common endocrine disorder of women in their reproductive period manifested by irregular menstrual cycles and polycystic ovaries, excess unwanted hair and baldness, although not all patients have all these features. The term 'polycystic' means 'many cysts', and PCOS gets its name because of the clusters of small, pearl-size cysts in ovaries. These cysts are fluid-filled bubbles (called follicles) that contain eggs that have not yet been released because of the hormonal imbalance. Many women with PCOS demonstrate challenges to feminine identity and body image due to obesity, acne and excess of unwanted hair; also, infertility and long-term health-related concerns that compromise the quality of life and adversely affect mood and psychological well-being. Some authors have shown that women who have PCOS are more prone to depression, anxiety, low self-esteem, negative body image and psychosexual dysfunction. PCOS is a heterogeneous endocrine disorder that affects about 1 in 15 women worldwide. The prevalence of PCOS in the Indian subcontinent Asian women was 52%. However, recent findings from countries such as China and India, which are undergoing rapid nutritional transitions due to Westernised diets and lifestyle, indicate similar prevalence rates of PCOS. Prevalence of PCOS in Indian adolescents is 9.13%. This draws attention to the issue of early diagnosis in adolescent girls. Polycystic morphology is seen on ultrasound in approximately 22% of women. Lack of awareness and lifestyle changes are considered to be the major factor leading to this phenomenon. PCOS has now become a common health problem that affects teenage girls and young women. In India, nearly 40% of women are affected by PCOS. But among them, only 60% report to hospitals for treatment, when they recognise that they have got infertility. Up to 40% of women with PCOS develop either impaired glucose tolerance or type 2 diabetes by age 40 as reported in the British Journal of Obstetrics and Gynecology in 2000. Large amounts of testosterone is secreted in PCOS which possibly prevent ovaries from releasing an egg each month, thus causing infertility, which may be the result of high levels of insulin that stimulate ovaries to produce excess testosterone. High testosterone levels can also cause excessive hair growth, simulating male pattern baldness and acne. In patients with PCOS, insulin resistance causes fat deposition and excessive production of testosterone. There is a parallel increase in the prevalence of PCOS and type 2 diabetes mellitus world over. Use of different diagnostic criteria may partly account for it, as has recently been shown (18%) in the first community-based prevalence study based on the current Rotterdam diagnostic criteria. Education, awareness and self-control are the only way to control it from rising further and affecting more women. The cause of PCOS is unknown, but studies suggest a strong genetic component that is affected by gestational environment, lifestyle factors or both. Women who have PCOS are at an increased risk for cardiovascular disease, diabetes and pre-diabetes, endometrial cancer, heart attack, hypertension, high levels of low-density lipoprotein and low levels of high-density lipoprotein. Following is a case of PCOS in reproductive age group treated successfully with Homoeopathy. Her informed consent was taken. 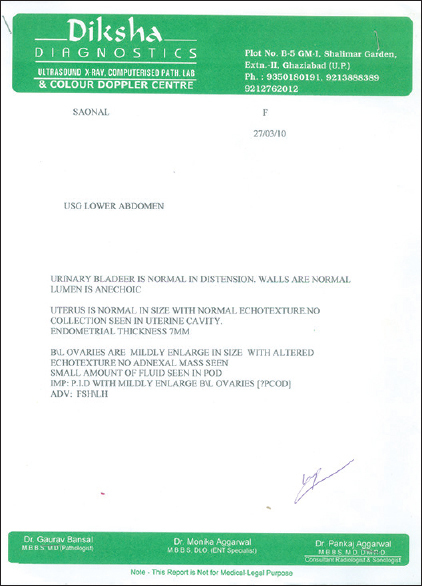 A 22-year-old unmarried female of height 162 cm and weight 70 kg with a clinical history of irregular menses for 2 years reported to the Outpatient Department (OPD) of DDPRCRI (H), Noida, on 24th April, 2010. Her duration of cycle was 45–60 days. She was also having complaints of soreness of breast before and during menses for 1 year which was relieved after menses. She also complained of abnormal hair growth on her face and abdomen and acne on face for 1 year. Apart from all these complaints, she was having thin, milky white leucorrhoea for 1 year and she was suffering from cold for 10 days with enlarged tonsils. The patient was overweight at a young age and gained about 8 kg since the last year. The patient was pursuing engineering curriculum. She was conscious about her weight and had low self-esteem. She took allopathic medicines for 3 months to regularise periods but without improvement. Subsequently, the patient was brought to the Central Research Institute (H), Noida, for homoeopathic treatment. On examination, she was obese, with a body mass index of 70/(1.62)2 =26.67 kg/m2 Waist circumference was increased at 95 cm. She had hyperandrogenism with hirsutism (Ferriman Gallwey score of 9), with Acne Global Severity scale of 2. Investigations revealed normal fasting glucose, thyroid-stimulating hormone, prolactin and 17 hydroxyprogesterone levels. A pelvic ultrasound revealed polycystic ovarian disease (PCOD) and pelvic inflammatory disease (PID). [Figure 1]. Investigations for testosterone, follicle- stimulating hormone, luteinising hormone and dehydroepiandrosterone-sulfate were not done. It was recognised that her psychosocial features were likely to have negative impact on her quality of life and on her ability to self-manage this chronic disease as well as her ability to set and achieve lifestyle goals. This was addressed as a priority. Family history revealed diabetes in her paternal grandparents and her father, hypertension in her father and osteoarthritis and irritable bowel syndrome in her maternal grandmother. The patient was tall and fat. She was non-vegetarian, her thermal reaction was chilly and had a tendency to catch cold (throat infection from childhood). Her appetite was good and had desire for sweets, non-vegetarian food (chicken, egg), cold drinks and fast food. She had thirst for large quantity at a time. She also reported profuse sweat from hand, scalp and axilla. Bowel movements were irregular, passed every alternate day even during menses. Further, she was found to be cheerful, easy-going, lethargic and expressive on irritation. 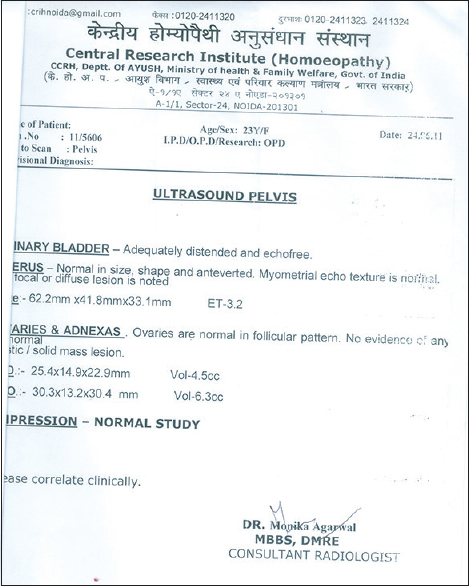 Investigations revealed pelvic sonography done on 27th March, 2010; PCOD [Figure 1]; last menstrual period – 22nd March, 2010; previous period was on 1st January, 2010 (before that taking allopathic medicine for 3 months to regularise menses, then left and found the same irregularities of period). Calcarea carb 30, tds – 3 days + placebo for 1 month and advised for regular exercise for 30–35 min/per day with avoidance of junk/fast food and high-calorie diet. This case is followed up to 7th July, 2011, as per the follow-up table [Table 1]. Repertorisation was done of the following symptoms. Chilly patient, tendency to catch cold, tonsil involvement since childhood, desire for egg, constipation, soreness of breast before and during menses and amelioration after menses (synthesis rep), leucorrhoea thin milky white (Boericke's Materia Medica pg. no. 146, reprint edn 2007) and tendency to gain weight. After repertorisation, Calcarea carb scored the highest rank [Figure 2]. PCOS, however, seems to be related to an imbalance in a girl's hormones; is the most common hormonal reproductive problem in women of childbearing age. The most important step is to diagnose the condition in time and provide proper treatment for PCOS so that it will help to reduce a girl's or young woman's chances of having serious side effects later on. The conventional medical management of PCOS is symptomatic treatment and lifestyle modification with weight reduction. Metformin, oral contraceptives, anti-androgens, clomiphene citrate and thiazolidinediones are used for the management of different presentations of PCOS. Metformin is commonly used either alone or in combination with other medicines for the treatment of most of the clinical manifestations of PCOS. Moghetti et al. concluded after a study that metformin treatment reduced hyperinsulinaemia and hyperandrogenaemia, independently of changes in body weight. In a large number of patients, these changes were associated with striking, sustained improvements in menstrual abnormalities and resumption of ovulation. The most common side effects of Metformin are nausea, vomiting or diarrhoea. Lactic acidosis is a dangerous condition that can be caused by Metformin. Also, the cost of Metformin is approximately $75.00/month. Homoeopathic treatment has no side effects and holistically treats individuals. Homoeopathic medicines can modify general tendencies, thus causing cure of conditions. Homoeopathic literature mentions many medicines for the conditions, of which a similimum can help a patient for keeping the disease at far away for a longer period as evidenced in this case. Homoeopathic medicine gives safe and gentle treatment in a cost-effective way, whereas in vitro fertiliszation and surgical resection and metformin cost a lot. Cinar et al. concluded after a study, mentioned in CCRH protocol for PCOS, that depression and anxiety are more common in patients with PCOS as compared with healthy women. Depression in PCOS might be associated with obesity and metabolic abnormalities including insulin resistance and dyslipidaemia., In another study, the author concluded that overall, depression, anxiety mean scores and depression rates did not show a significant change in cases of PCOS after treatment with OCPs. Homoeopathic treatment is based on the holistic approach; therefore, all such aspects are taken into account for prescription. Besides, many studies found homoeopathic medicines to be effective. In a double-blind randomiszed controlled trial study by Sanchez-Resendiz and Guzman-Gomez(1997), 36 women suffering from PCOS, and fitting the mental picture of the homoeopathic remedy Pulsatilla, were given Pulsatilla 6C, 4 h throughout the day for 2 weeks after the end of menstruation, and this was repeated for 4 consecutive cycles. At the end of the trial, 30 of the 36 women had no symptoms of PCOS and they had normal ovulating follicles and 4 of the 36 women became asymptomatic. In this case, the diagnosis of PCOS was confirmed, with the presence of hyperandrogenism and irregular menstrual cycles as well as polycystic ovaries on ultrasound. The symptoms of PCOS are the major source of psychological morbidity and can negatively affect the quality of life of adolescents or young women. In this case also the patient was worried about her weight and personality. Calcarea carb ultimately proved to be the indicated medicine as the first prescription, going by the result of repertorization. The potency 30 was selected in the beginning followed by 200 potency. The potencies 30 and 200 were able to regularise the menses. Then the potency was increased to 1M when free fluid was found in pouch of Douglas (POD) and pain in lower abdomen and leucorrhoea was persisting indicating PID. 1M potency was given with required result i.e., to remove pain in the lower abdomen and the free fluid in POD. Ultrasonography (USG) showed normal study [Figure 3]. This case was successfully treated as the patient was regularly followed-up. Again when the patient came to OPD for fever and pain abdomen, she was advised to do USG pelvis which showed normal follicular pattern [Figure 4]. As PCOS is among the most common diseases during adolescence, there is always a need to investigate all new relevant data. Early recognition and prompt treatment of PCOS in adolescents is important to prevent long-term sequelae. Homoeopathy can take care of chronic hormonal syndrome in an individual, where allopathic hormone-related treatment or surgery is otherwise advised. Non-recurrence of complaint in the past 3 years suggests that PCOS can be treated successfully through individualised homoeopathic medicine with lifestyle management. However, a well-planned study with large sample size is required to establish the efficacy of Homoeopathy in PCOS. Now, the Central Council for Research in Homoeopathy is conducting 'A randomized controlled pilot study on Management of polycystic ovarian syndrome with homoeopathic intervention versus placebo'. The authors certify that they have obtained appropriate patient consent form. In the form, the patient has given her consent for her images and other clinical information to be reported in the journal. The patient understand that her name and initials will not be published and due efforts will be made to conceal her identity, but anonymity cannot be guaranteed. Sheehan MT. Polycystic ovarian syndrome: Diagnosis and management. Clin Med Res 2004;2:13-27. Deeks AA, Gibson-Helm ME, Teede HJ. Anxiety and depression in polycystic ovary syndrome: A comprehensive investigation. Fertil Steril 2010;93:2421-3. Rodin DA, Bano G, Bland JM, Taylor K, Nussey SS. Polycystic ovaries and associated metabolic abnormalities in Indian subcontinent Asian women. Clin Endocrinol (Oxf) 1998;49:91-9. Hurd WW, Amesse LS, Randolph JF Jr. Endocrine disorders. In: Berek JS, editor. Novak's Gynecology. Philadelphia: Lippincott Williams & Wilkins; 2002. p. 1175. Nidhi R, Padmalatha V, Nagarathna R, Amritanshu R. Prevalence of polycystic ovarian syndrome in Indian adolescents. J Pediatr Adolesc Gynecol 2011;24:223-7. Hart R, Hickey M, Franks S. Definitions, prevalence and symptoms of polycystic ovaries and polycystic ovary syndrome. Best Pract Res Clin Obstet Gynaecol 2004;18:671-83. Haridas A. Infertility and Polycystic Ovarian Syndrome. De Paul Times. April 2009 [E-Journal]. Available at: https://sites.google.com/a/depaul.edu.in/de-paul-times/022009/020910. [Last accessed on 2018 Jun 27]. Ganie MA, Kalra S. Polycystic ovary syndrome – A metabolic malady, the mother of all lifestyle disorders in women – Can Indian health budget tackle it in future? 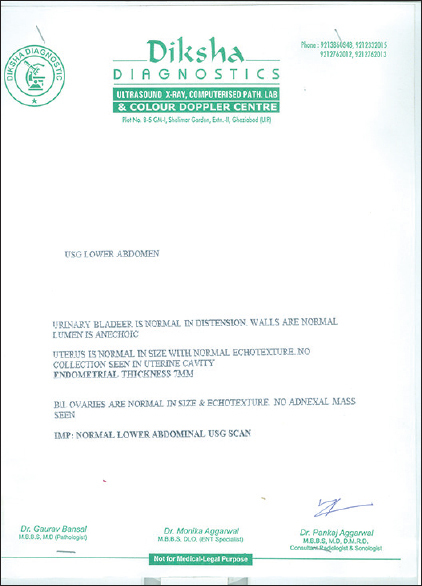 Indian J Endocrinol Metab 2011;15:239-41. Roe AH, Dokras A. The diagnosis of polycystic ovary syndrome in adolescents. Rev Obstet Gynecol 2011;4:45-51. Dréno B, Poli F, Pawin H, Beylot C, Faure M, Chivot M, et al. Development and evaluation of a Global Acne Severity Scale (GEA Scale) suitable for France and Europe. J Eur Acad Dermatol Venereol 2011;25:43-8. Moghetti P, Castello R, Negri C, Tosi F, Perrone F, Caputo M, et al. 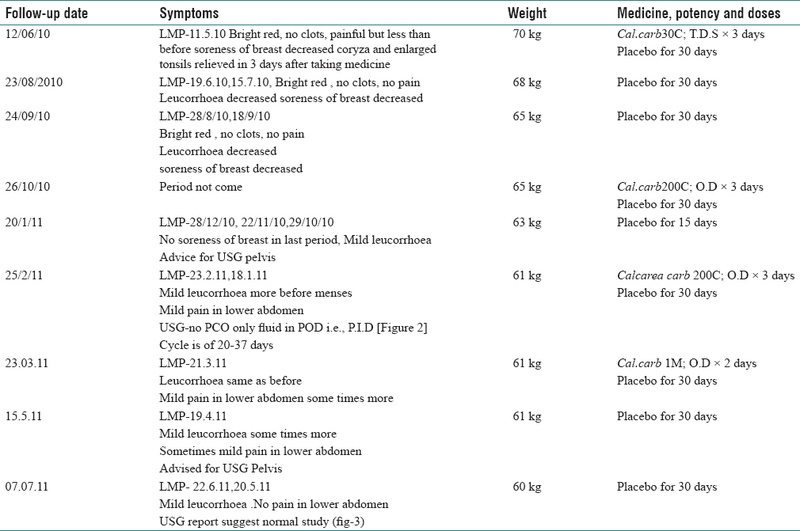 Metformin effects on clinical features, endocrine and metabolic profiles, and insulin sensitivity in polycystic ovary syndrome: A randomized, double-blind, placebo-controlled 6-month trial, followed by open, long-term clinical evaluation. J Clin Endocrinol Metab 2000;85:139-46. Anonymous. Metformin Available from: http://www.medsafe.govt.nz/profs/Datasheet/m/Metformintab.pdf. [Last accessed on 2018 Jun 27]. George GT. Hirsutism Treatment & Management. Medscape. Available from: http://www.emedicine.medscape.com/article/121038-treatment. [Last updated on 2015 Jul 27]. Central Council for Research in Homoeopathy. Homoeopathy in polycystic ovarian syndrome: A randomized placebo-controlled pilot study. Indian J Res Homoeopathy 2014;8:3-8. Cinar N, Kizilarslanoglu MC, Harmanci A, Aksoy DY, Bozdag G, Demir B, et al. Depression, anxiety and cardiometabolic risk in polycystic ovary syndrome. Hum Reprod 2011;26:3339-45. Sanchez-Resendiz J, Guzman-Gomez F, Polycystic ovary syndrome. Bol Mex Homeopatica 1997;30:11-5. Jones GL, Hall JM, Balen AH, Ledger WL. Health-related quality of life measurement in women with polycystic ovary syndrome: A systematic review. Hum Reprod Update 2008;14:15-25.